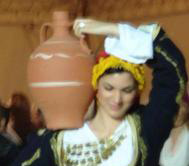 The Klidonas Custom revives every year in Tolo on the 24rd of June, one day prior to St. John the Prodrome day. A girl, whose parents were alive, went to a fountain, filled a water jug in absolute silence and brought the jug back to her home. There were young boys and girls waiting to throw something personal, like a ring or an earring into the jug, which stayed outside the house during the night, in order to be seen by the stars. On the next day, St. John the Prodrome’s day, the boys and girls met again, taking their personal items out of the jug, singing at the same time funny and naughty poems. Every poem used to be considered as an omen for the boy or the girl to whom the item that came out belonged.